Being able to get out of the house and go where we want on a whim is a freedom many of us have long enjoyed and may even take for granted. Driving represents much more than just a daily routine; it symbolizes both competence and independence. And, it can be an incredibly hard activity to give up. The need for sustained concentration and quick reaction time tends to decline as we age, and for someone with Alzheimer’s disease or another form of dementia, this process accelerates dramatically, making it difficult for loved ones to know when it’s time for the senior to stop driving and find alternate transportation options. Most experts believe it’s important to help the person with dementia stop driving as soon as possible. One good rule of thumb is to ask yourself: “Do I feel safe riding in a car or having my family members, including kids, riding in a car that the person with dementia is driving? And, would I feel safe if my children were playing on the sidewalk on a street where the person with dementia was driving?” If the answer is no, then you know it’s time for him or her to no longer drive. If your loved one will not stop voluntarily, check with the state Department of Motor Vehicles to find out their process for evaluating a person’s driving ability. Many facilities offer thorough driver safety evaluations to determine whether it is safe for a person to continue driving. You can also request a note from your loved one’s doctor indicating that he or she should stop driving, or simply take control of the keys if needed. Keep in mind that the ability to drive gives your loved one a sense of independence, and losing that freedom isn’t easy. Arranging for alternative transportation through the services of a professional home care agency, like Hired Hands Homecare, can help make the transition easier. At Hired Hands Homecare, we can see that your loved one is able to safely get to social events, doctors’ or hair appointments or outings to the grocery store, park, church, etc., accompanied by one of our trusted caregivers. If it’s time for your senior loved one to stop driving, contact us at 866-940-4343. 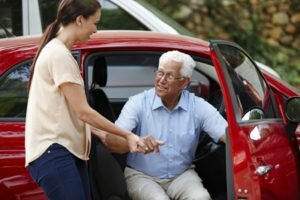 We’re always available to plan and arrange for your loved one’s accompanied transportation needs, and to assist with any other California senior support services you need.